In the hotel, we had access to a coffee machine. John’s plans had nothing to do with one. They did have to do with a french press and some freshly ground Hawaiian coffee beans. Nothing shy of brilliant if you ask me. What, no access to heat either? Covered, thanks to a pack stove. To be honest it could have been the microwave, but the stove was used for dinner the night before. John likes his coffee strong, this was a matter of observation more than a stated question. The coffee did it’s thing in the bloodstream and the truck was packed before I even realized that I was awake. Where to now? 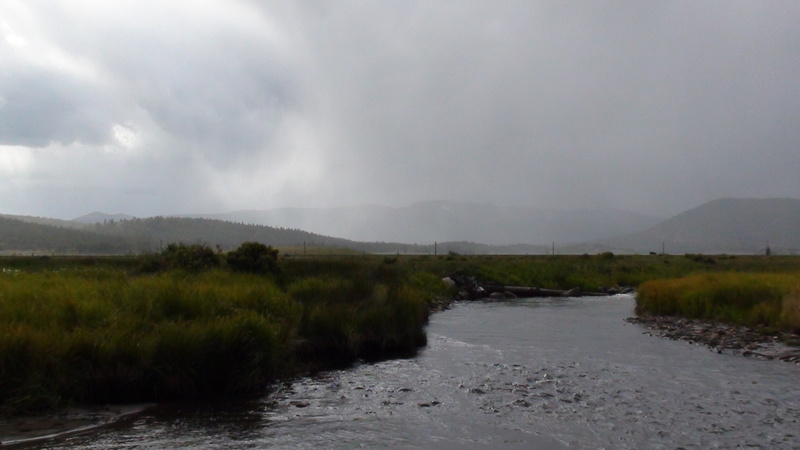 A couple of stops were made at certain secret locations to get our waders wet and fish some interesting water. 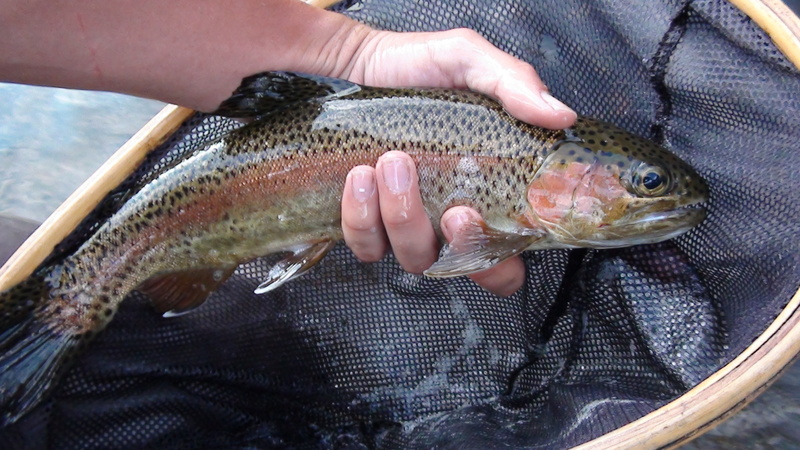 As odd as it may sound, catching fish was not as high of a priority as fishing. To me, this does make sense in the way that John fishes. See, John doesn’t fish. He catches. Because of his catching ability, he reminded me of some things that I had forgotten over the past couple years and maybe taught me a few things as well. After going for a swim early in the day, Steven was repaid 2 fish for his karmic balance and a proud father stood close by cheering his son on. The kid is persistent and takes after his father. He out fished me during the morning session at 11 mile and I would be lying if I said that I wasn’t happy about it. The day wore on with some of the most angry fish I had ever been up against. 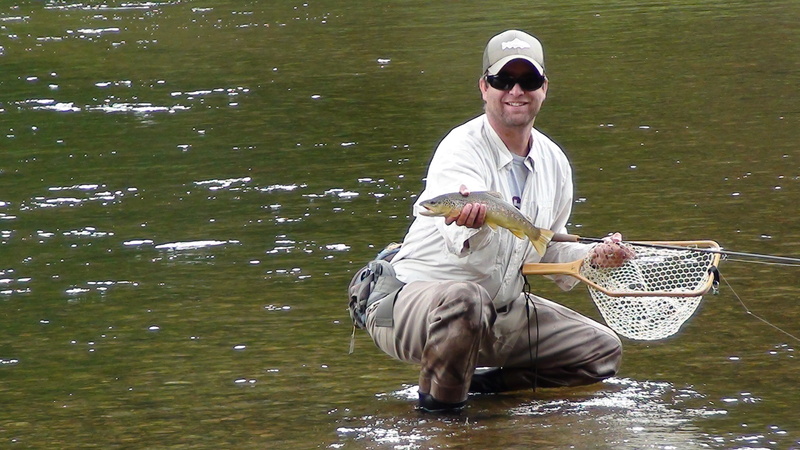 Wading in stiff current, you find yourself playing goal tender to incoming freight trains and if you are slow with a net, say goodbye to your fly and fish. As the evening settled in, John showed his skill with the big fish of the day. We fished until we couldn’t see and the evening turned into night. A cigar, beer and recent memories played in our heads on the somewhat silent trip home and I had forgotten that all of this time I had been out fishing with my boss. It has been a long time since I had a weekend like that, maybe even a lifetime. Lesson #14: Ants are harder to remove from waders than they are from pants. Be careful where you sit. The morning smelled of fish. Maybe it was from the rain the night before. Maybe it was the prophetic fishy senses that kick in upon the morning of fishing. It was too early to tell. 4:00am isn’t exactly the time for epiphanies, or prophecies for that matter. Heck, the sun wasn’t even ready to kick off the day yet. Thoughts of the day to come circled through my head and it wasn’t long before I began to think about the situation that I had gotten myself into. Fishing with the boss. Not technically my boss, but the boss above my boss. I packed to prepare for the day thinking that one fishes to get away from the stresses of work and everyday life. The reset button if you will. Many nights at work have been spent talking to “The Boss” (John) until well after my 10:00pm bedtime. I was worried that the conversation around riverside would revolve around work. With John’s 13 year old son Steven in tow, the 3 of us traveled to more “Dreamy” locations of Colorado’s renowned South Platte River. The 2.5 hour drive felt much shorter than it was while sharing stories of the past. John is one of those people that has a bottomless pit of stories. He has been fishing for around 20 years and it isn’t difficult to gather those stories over that amount of time. 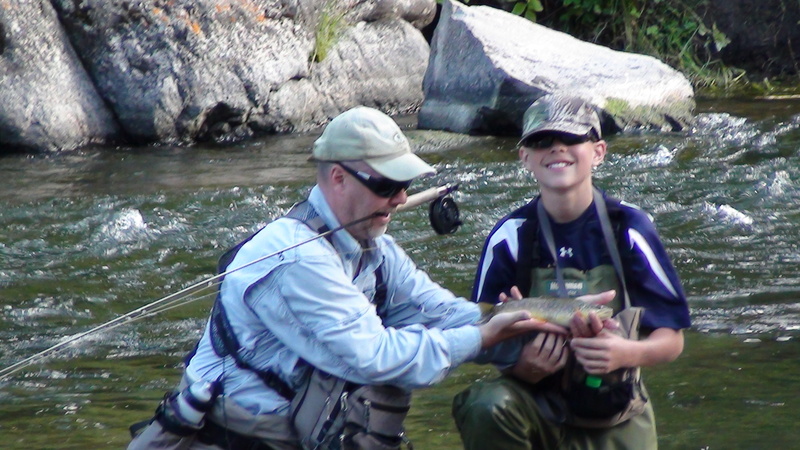 A die hard fly fisherman to the core, and that same intensity rubbed off on his son. We arrived at some of John’s more well known water, where he knew all three of us could pick up some fish. Maybe it was also to feel me out as a fisherman or just a boatload of B.S. I assure you that I’m not a liar, but when it comes to the size of a fish, I might add an inch or two. Never 3. It took a little time to get on the water after setting up a lunch site complete with a table and chairs, and unheard of luxury in my world. We even had plastic utensils! When we did make it to the water, John was the first to quickly pick up a fish while I struggled with a hole that I knew held a monster. I missed a lot of strikes due to excitement. 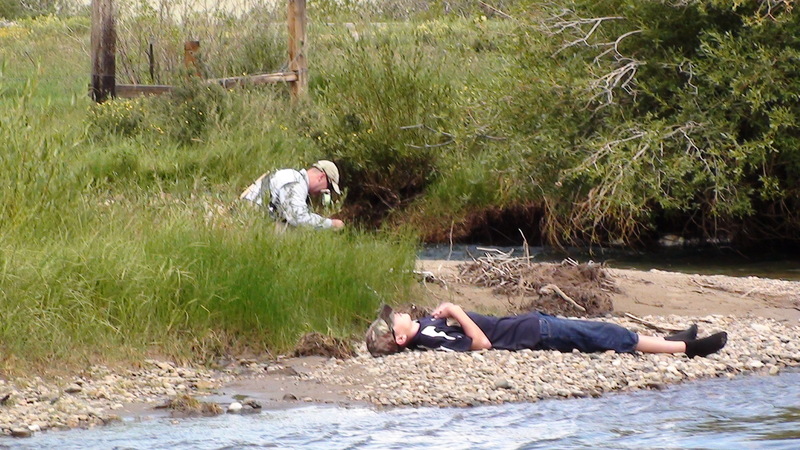 When I peered around the bend, Steven had caught his first one of the day as well. I still struggled. John picked off more fish from water that didn’t look like it even held fish and I was curious to know what I was doing so wrong. In my defense, I’m not used to fishing these medowy type rivers. I’m used to dense cascading water that races down the mountain. 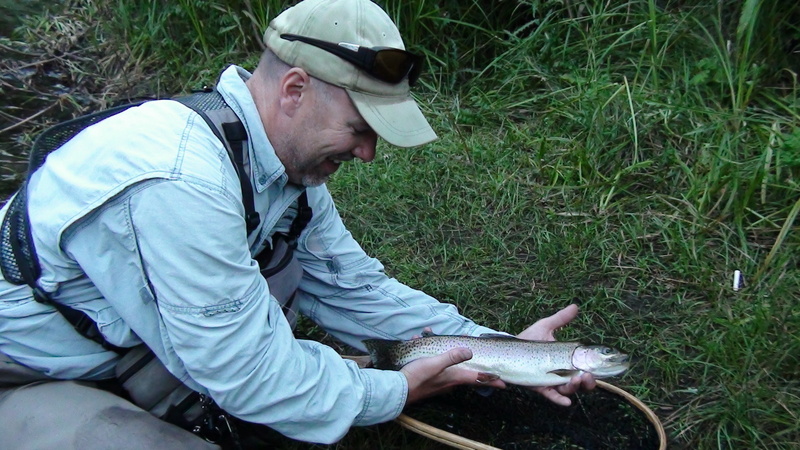 The fish that I brought to hand was a surprise and it didn’t take long for me to find a groove. Lunch at riverside was amazing. John and I split a bottle of wine and munched on sandwiches and fresh fruit. Lunch couldn’t have been more complete unless we had cigars. Well, I guess we did that too. We relaxed for a while there and people began to peel off of the river, leaving only the three of us at 2:00pm. For the rest of the day we had the river to ourselves. Until the storm came uninvited. We meet very interesting people in our lives. Even something as simple as blogging can bring people together. Aside from having fishing in common, bloggers tend to have the same addiction to talking about fishing during times it may be inappropriate. You just never know when it will come out, but some things just happen to trigger a fishing story. A deep conversation can begin here, but we have to move things forward. Feel free to comment with an awkward time to bring up fishing. It is our passion that fuels the stories and the stories to come. So far, Mike from Dry Flies & Fat Tires has shown me how passionate about fishing he really is and his excitement about it fuels the ones who have the chance to fish with him. Go check out his blog! 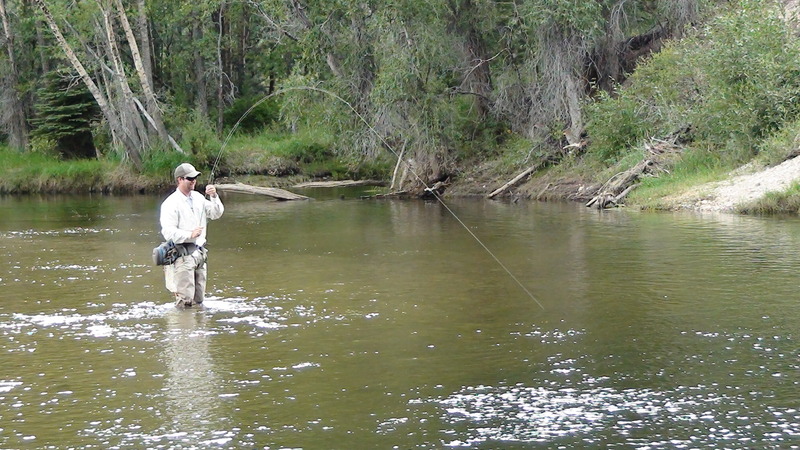 Next, and my second experience with another blogger was Sanders from Up The Poudre. Sanders and I have a lot in common when it comes to fishing. He gets a bit over-excited to fish and forgets some simple things like… Lunch. Well, so did I. Maybe we should both read Lesson #2 again. 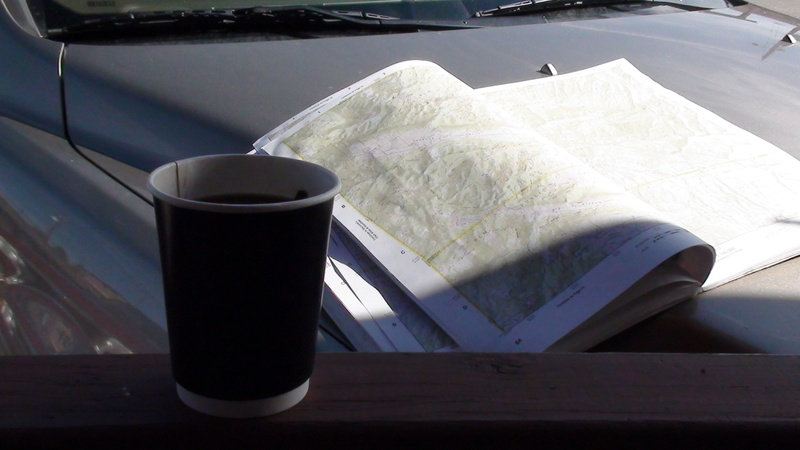 We met at 6am to head up Poudre canyon to fish Sanders’ home water. Water that I have never seen below 2,600 cfs, let alone fished, or even thought about fishing. I had no idea what I was getting into. This day it was 400 cfs. Driving up the canyon my eyes were alight at every hole, knowing that it contained massive amounts of fish. I recall telling Sanders more than a few times, “look at that hole”. I’m sure he knew them all, we were in his home water. However, we headed into new water for him as well. Our destination was a little higher up river. Our excitement grew as did elevation. Sanders found his target spot quickly and soon we were off fishing without a hitch. …or so I thought. While crossing the river, I looked back to see Sanders holding a bag in the air proclaiming, “It’s dry! 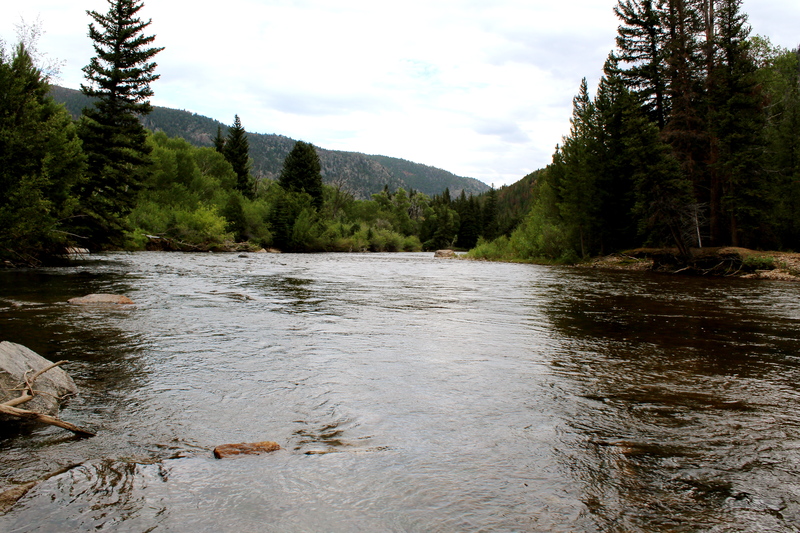 It’s dry!” Confused, I remembered the hole in my waders and felt the cold water begin to drain to my foot. When we arrived at shore, I learned that he had lost his footing. If it is any consolation, I almost peed my pants crossing the river. Maybe I did, but I was wearing waders. Who would know? The day wore on with no fish to hand. Not really a problem to me. I’ve worn the skunk shoes before. This river was different. From midges to caddis to beetle and everything in between, nearly everything in my box. Buggers to emergers, and nymphs of all sorts. Failed. Then, a glimmer of hope from Sanders with his brown that didn’t seem to fight like one. My day was complete at that moment. 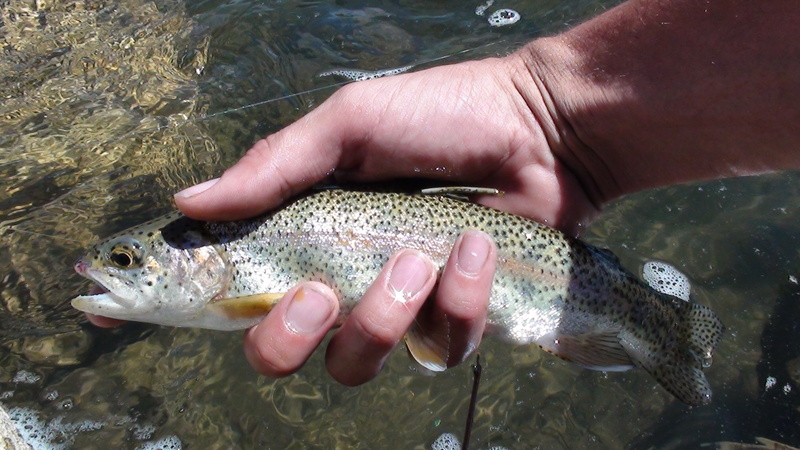 A fish to hand between us, not my hand, but we beat the river. No need to catch anything for the remainder of the day, I was happy. Afterward, he suggested we move up river. Good suggestion I thought. Just a couple holes showed up and one provided me a fish. I could’ve fainted. 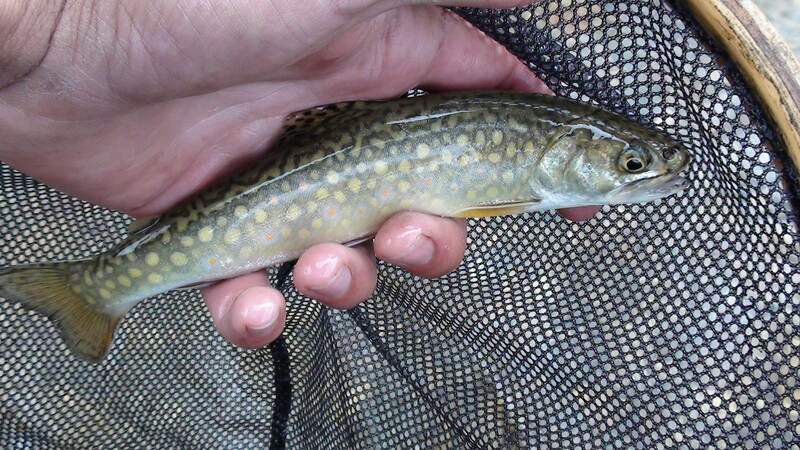 I know it was a dink in comparison to the brown Sanders caught, but it was a brookie! We shared more laughs at the fishes expense and I was refilled with anticipatory fuel, but it was time to head down the Poudre. I struggled fishing perfect drifts through the best seams as Sanders practiced “new techniques” and started hauling in fish. It was late in the day and I’m sure a lot of laughter bounced off of the canyon walls as he pulled in miracle fish but sometimes even the fun trips have to end and return to that daily grind. Besides, there were no more crullers left and we were both hungry. Before I finished writing this, I stopped by Up The Poudre and saw the headline of “A New Friend”. I haven’t made many of those in my life, but Sanders is one of them. I’m very glad and somewhat humbled to have the chance to fish with the guy. If you still haven’t gone to read his blog, go now. Lesson #13: Although addicting, crullers are not a substitute for lunch. 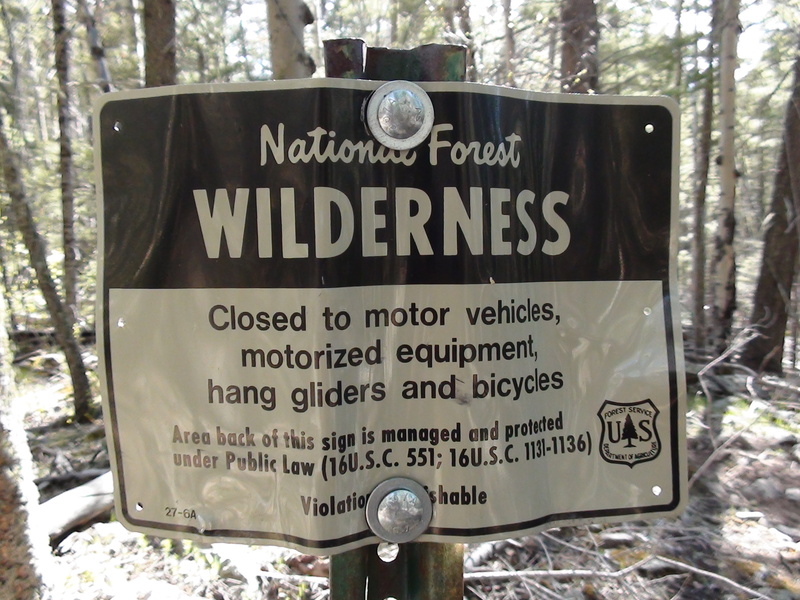 As dangerous a sport as hang gliding is, somehow it is unlawful over wilderness areas. Maybe due to the danger involved, but I wouldn’t know. It works though, as I am also hang gliding over the next two weeks, metaphorically. This post is really just a post to float me to the next week. I woke up this morning to a certain freeze-you-to-the-core type of cold, knowing that the frontal boundary sailed over the front range. It’s insult to me unwitting, but harsh. The memory of last winter was still fresh in my head as I looked to the west and received the daily morning input of nicotine. In that moment, I inhaled the bite in the air and realized that cold was soon to come. 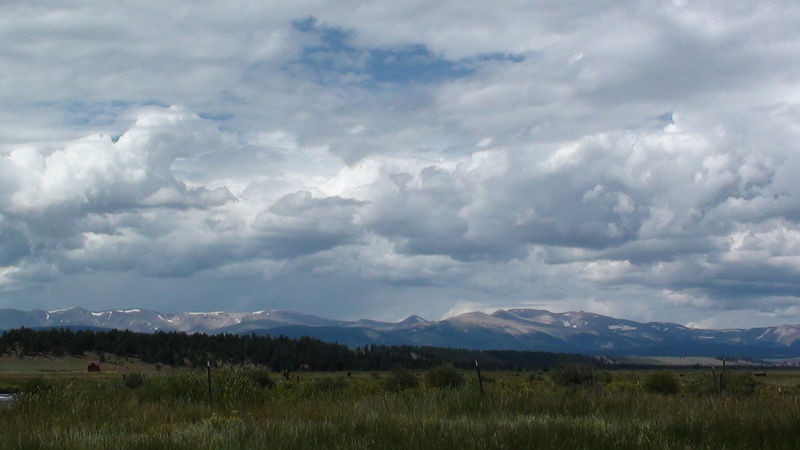 Even this summer was not really summer here in Colorado. The summer here was reminiscint of a drawn out spring, keeping fisherman indoors, away from their fix. Keeping me away from the adrenalin rush, the puzzle solving, and the release of tension after a full day out. Keeping me away from those big fish. Driving south on 225 on my way to work, my muscles began to itch with that familiar pull. The itch to manage tension between myself and a fish capable to accelerating to 20mph in one second, as fast a a Lamborghini. Muscles quick to release when hooking into a freight train. I pulled against the steering wheel to calm the nerves and relieve the itch to no avail. The accelerator pedal was on the floor to drive away the thoughts, nothing. Arriving at work, my feet began to beg for uneven terrain, bored from slapping against flat ground. They needed to grip and pull dirt from an untrodden trail. My ankles wished to ascend. Even stairs did no justice, nor did running. As the work day progressed, the itch began to work it’s way to my knees that prayed for the resistance of flowing water against them, for the rush of cold waders pressing against them. My shoulders wanted to cast, and no amount of lifting subdued them. Oh, and that smell of fish on the hands… Need I say more?